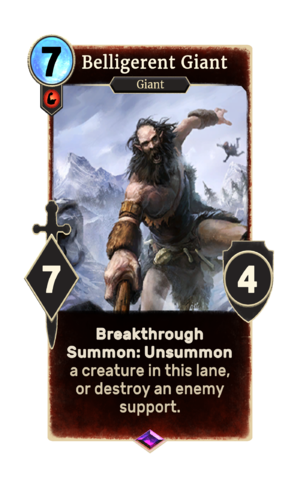 Belligerent Giant is an epic Strength creature card. It is part of the Core Set. In a humorous nod to Skyrim, the card's art depicts an unfortunate creature or adventurer flying in the background. Prior to July 2017 and Update 65.2, the card's summon ability read: "Summon: Unsummon a creature, or destroy an enemy support." The card's summon ability could originally only unsummon enemy creatures. This page was last modified on 24 September 2018, at 22:25.